Below is a list of unigenes available for Prunus persica. Click the unigene name for further details. The cultivated peach (Prunus persica) is a diploid (2n=2x=16) and has a relatively small genome (~265Mb). It belongs to the Rosaceae family, Prunoideae subfamily, and Amygdalus subgenus. 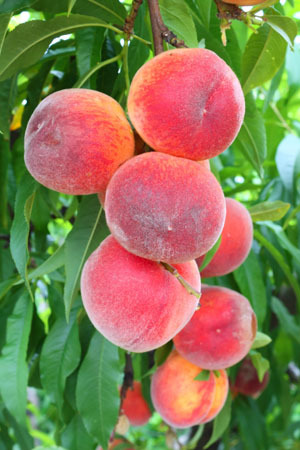 Peaches originated in China, where documented evidence showed cultivation started over 3,000 years ago. The species name resulted from an early misconception that the peach originated in Persia. Peaches probably were brought from China to Persia through the Silk Route and then introduced to Greece and other European countries. Modern cultivars in North and South America descended from European and Chinese selections. For example, many cultivars in the US may be genetically related to ‘Chinese Cling’ that was introduced from China to Georgia, USA by Charles Downing in 1850 and widely used for selection of varieties suitable for local industrial production. Peaches are one of a few temperate fruit crops that can be commercially grown in many countries and under diverse climatic conditions. Peach cultivars vary in cold hardiness and chill requirement (accumulated hours below 7°C). The chill requirement for normal flower bud differentiation ranges from less than 100 to more than 1,000 hours allowing adaptation even in subtropical or cold regions. Peach trees are generally propagated by grafting scions (cultivars) onto suitable rootstocks, to maintain the true-to-type scions and take advantage of better adapted and resistant rootstocks. Peach trees usually have an upright to moderately spreading architecture. Flowers are self-compatible and fertilization usually occurs 24-48 hours after pollination. Fruits are a drupe composed of skin (epidermis), flesh (mesocarp), and stone (endocarp) enclosing the seed. Ripening peach can be clingstone (flesh adhering to the stone) or freestone (flesh separating from the stone); melting (flesh quickly softening) or non-melting (flesh remaining firm). Peach are tasty and rich in healthy pigments and micronutrients. Conventional breeding remains mainstream, largely due to relatively short juvenility, easy hybridization, and low heterozygosity, to improve size, firmness, quality, blush, disease resistances, maturity seasons, and horticulture performance. Below is a list of transcript assemblies that are available for Prunus persica. Click the assembly name for further details.